Our hotel is a beautiful result of a unique architectural style and solution. Air-conditioned public halls and rooms which are modern in all aspects have been formed by creating a new floor in a civil flat from the last century, with preserving its architectural style. 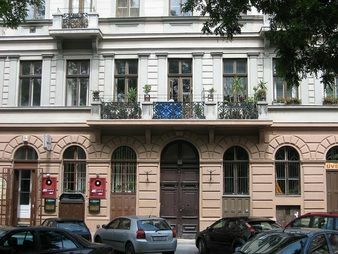 Hotel Silver Budapest*** can be found in the heart of the city – Hunyadi square 11 in the 6th district. Thanks to the advantageous location our hotel is part of the capital’s cultural and entertaining area. The most spectacular Andrássy Avenue, both the Oktogon and Liszt Ferenc square and of course Nagymező street which is known as the theatre area of the town can be easily reached on foot from the hotel. If you would like to go for shopping and spend your time in one of the biggest shopping mall of Europe – it only takes you 10-15 minutes on foot to reach the Westend City Center. Of course pretty cafés, traditional fast food restaurants aren't missing from the nearby and you also find a fine market for buying fresh fruits and vegetables and also some meat. The most famous sights of Budapest can be reached within some minutes by public transport. These are the Opera House, the Parliament of Hungary, the Museum of Fine Arts, the Museum of Hungarian Agriculture, the Art Hall, the Széchenyi Thermal Bath, the City Park, the Castle of Vajdahunyad and of course the biggest and most amazing square of Budapest – the Heroes’ square. What is even more important – the Millenium Underground that has been running for a century under the surface along Andrássy Avenue is only a jump from the hotel. The Millenium underground was the first underground line of Budapest and one of the earliest line in Europe. The total capacity of the room is 3 adults. With children under the age of with children under the age of 2, max. 4 people guests can be placed in the room. The total capacity of the room is 2 adults. With children under the age of with children under the age of 2, max. 3 people guests can be placed in the room. The rating of Silver Hotel Budapest is 8.6 from the maximum of 10, based on 137 real guest reviews. "it needs to be CLEAN all over." "friendly staff who helps with everything." "A fent is megjelölt központi elhelyezkedés előnyös illetve a recepciós kollégák segítőkészsége."